In February of 1968, Teddy Calhoun came home from Vietnam and brought a piece of the war back with him. Through a prism of battle fatigue and schizophrenia, his vision of Nebraska has changed into a threatening landscape of violence and enemy occupation. Now, Teddy will do whatever he must to protect his family from the murderous approach of ''Charlie'' and an army of the risen, hungry dead. 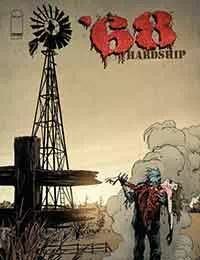 ''68 Hardship is a journey into a psychological realm of hallucination, violence and undead horror. Written by MARK KIDWELL, with monstrous artwork by JEFF ZORNOW and JAY FOTOS, this one-shot is a direct tie-in with the regular ongoing ''68 series, extending the world of Vietnam/Zombie horror to America''s heartland and your own backyard.